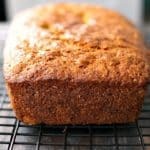 Home » Breakfast » Easy Vegan Gluten Free Banana Bread. Easy Vegan Gluten Free Banana Bread. 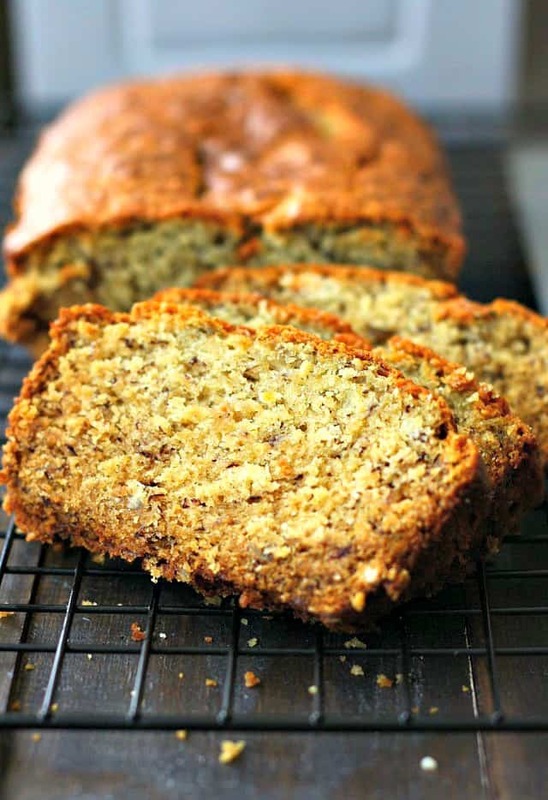 This vegan gluten free banana bread is moist, delicious, and perfect for breakfast or a snack. 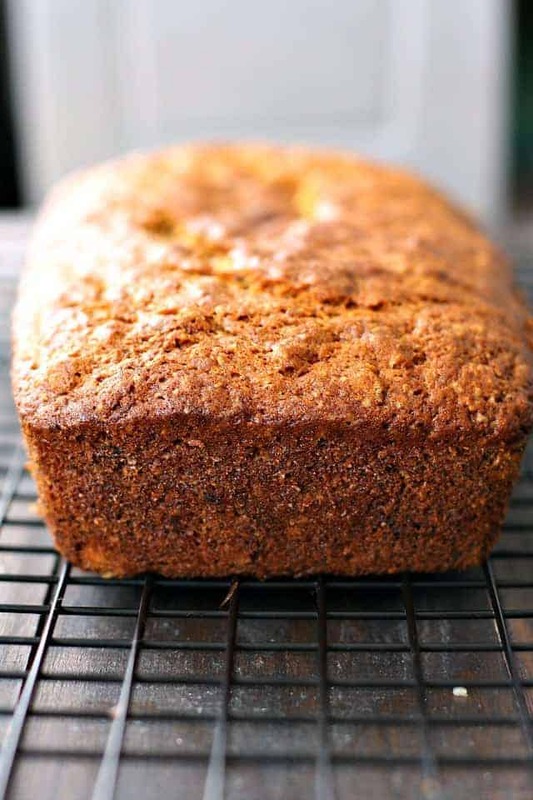 Using very overripe bananas give this bread a wonderful, rich flavor. Banana bread…it’s the perfect thing to bake when you’re in the mood for something warm and cozy and homemade. A loaf of vegan gluten free banana bread fills your home with a wonderful, comforting aroma. There’s nothing like a slice of warm banana bread with some vegan buttery spread on a chilly morning. I have had trouble in the past with making vegan gluten free banana bread that has a nice texture without being gummy, but after some trial and error, this recipe works well for me. A light gluten free flour mix like my blend helps keep this recipe light, and not too dense. King Arthur Gluten Free Flour would also work well, if that’s a brand that’s safe for your dietary needs. Can you make this vegan gluten free banana bread recipe with coconut flour? Coconut flour works best when you use eggs, so I don’t think that it will work in this recipe. Using coconut flour in this recipe will result in a dense, heavy loaf of bread. 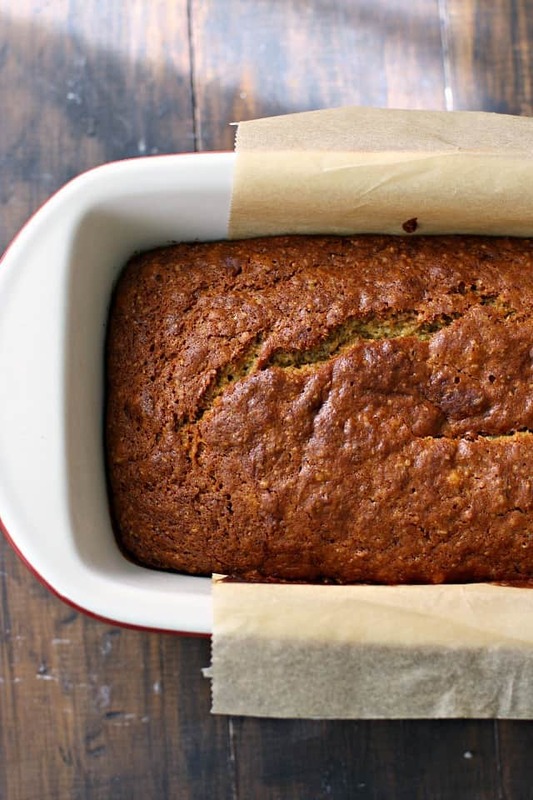 Will this banana bread recipe work with almond flour or oat flour? If you’d like to add almond flour, you can use up to 3/4 cup almond flour and another one cup gluten free flour blend. Almond flour may make this loaf a little bit heavier. If you’d like to use oat flour, you can use up to 1/2 cup, with another 1 1/4 cup gluten free flour blend. Using more oat flour than that may result in a loaf that’s crumbly and falling apart. You’ll want to start with overripe bananas – I store mine in the freezer. If yours are frozen, let them thaw first. Place thawed bananas in a bowl and mash with a fork. Add sugar, gluten free flour, and the rest of your ingredients, and stir well. Pour the batter into a loaf pan that’s lined with parchment paper so it hangs over two sides of the pan. Bake at 350 degrees for about 40-45 minutes, until the top is golden brown, and a toothpick inserted in the middle of the loaf comes out clean. Remove from the pan and place on a cooling rack. Allow to cool fully before slicing. Have you made this recipe? Please share on Instagram, and tag me @prettybeeblog so I can see your creation! This easy gluten free vegan banana bread is super moist and full of flavor! Preheat oven to 350 degrees. Line a loaf pan with parchment paper so that there is an overhang on both sides of the pan. Place the coconut oil in a small bowl. Microwave for 15-20 seconds until the coconut oil is melted. Put the bananas in a mixing bowl and mash with a fork. Add the coconut oil and stir. Add the sugar and vanilla, water, and vinegar, and mix until combined. Add the gluten free flour, baking soda, baking powder, and salt and mix together. Spoon into the prepared loaf pan*, and bake at 350 degrees for 40-45 minutes or until a toothpick inserted in the middle comes out clean. Cool for 30 minutes in the pan, then remove from pan and cool on a cooling rack. Once the loaf is fully cooled, use a serrated knife to slice it. * I used a 9x5 loaf pan. If you use a narrower loaf pan, you may have to bake it longer to make sure it is done in the middle of the loaf. You can use up to 1/2 cup of oat flour in this recipe if you wish. If you use more than that, the recipe may become crumbly. I've made this recipe with many different combinations - part spelt flour, part oat flour, gluten free flour only, a mix of gluten free flour and oat flour, etc. It always turns out well! (Spelt flour is not gluten free, so it's not suitable for those on a gluten free diet). If you'd like a chocolatey treat, try adding 3/4 cup of dairy free chocolate chips to this recipe. Let it cool quite a while before slicing, and then enjoy with some vegan buttery spread on top! This post was originally published in June 2014. It has been updated with new photos and text. « Gluten Free Cookie Dough Bites (Dairy Free, Vegan). Love the interactive checklist, so handy when I was prepping! I added walnuts and used maple syrup instead of sugar. It was a hit! Super easy to make and tasty. I added in dairy free dark chocolate chips and two tablespoon of cocnut. Your banana bread recipe is so good! I ended up leaving out the vinegar because I didn’t have it in my pantry, and the bread still turned out delicious! My batter is really thick???? Is this normal? This recipe is amazing! You can’t even tell it’s gluten free! I have never had a gluten free loaf turn out before…until now! I’m absolutely thrilled! Thanks so much! Sooo good! The family couldn’t tell that it was vegan. I used Bob’s Red Mill gluten free w/o xanthan gum (sensitive to xanthan gum). I also used one flax egg and Earth Balance spread. It took about an hour to bake. I covered the top with foil after 45 minutes. This was my first time making banana bread and I am super happy! I had to sub white vinegar for apple cider vinegar and cut the sugar in half but it was still delicious! I used to love Trader Joe’s banana bread and I was pleasantly surprised to find that this flavor and texture is 99% identical (1% for the gluten free texture). Can’t wait to give it to the kids for after school snack! I wish I could post a pic cos it looked beautiful too! Just made this and it did not come out well. It was extremely gummy. I followed the directions exactly how they were written so I have no idea what went wrong. This is my first time ever baking GF and vegan so maybe I misunderstood something? What gf flour did you use? So easy to make with my toddler who can’t have eggs, and great for me (gluten-free). Soooo yummy! Thank you! I made this today and it turned out really well. 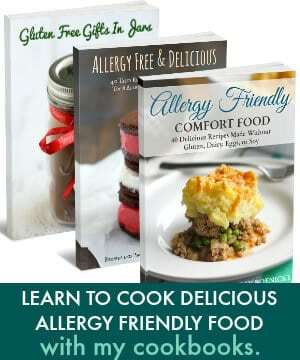 Thanks, as I am gluten, dairy and egg free, so finding recipes can be difficult. I used coconut sugar and didn’t have ACV so just used white vinegar. I am hoping my kids love it when they get home from school today! Turned out great! I used Bob’s gf blend with the blue label, half the amount of sugar (1 cup total), and doubled the recipe. Oh, and enjoy life chocolate chips, of course. It made 23 muffins and I baked them for about 25 minutes. Omg this is sooooo good! I love banana bread and been wanting to bake for my son who is allergic to egg, dairy and nuts. Thank you so much for sharing this delicious recipe!! 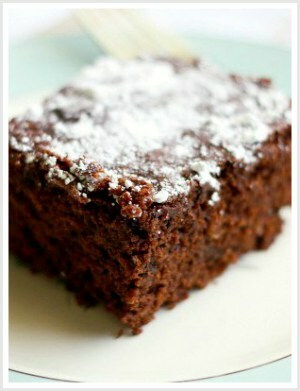 This is his new favorite in addition to your chocolate shortbread! Thank you for sharing this amazing recipe! You got it down to a science, which I have been looking for quite a while to get ideally perfect. Adapting, what I did different was use safflower oil (High heat point and neutral taste) and reduced sugar (date or sucanat) to a little over 1/4 cup for balanced sweetness. The Spelt flour is a winner. The bread rised without a hiccup and is baked through by 1 hour without burnt. It comes out toothpick clean. I made this today and it tastes delicious! However it was still raw on the inside after 45 minutes. I left it in but the outside got really tough while the inside was still just barley done. I used a one to one gluten free flour blend and all other ingredients were the same but I did add chocolate chips. Would love to make it again. Any suggestions to make it cool a bit better? Nice recipe for a vegan baking beginner! I used each 50 gr of Teff and corn flower, and 140gr of gluten free flour mix. Unfortunately mine came out a little dry in the end although I had just baked it for 20 minutes. And it was especially dry just a day later. I wonder if I could do anything better next time? I would think that the corn flour may dry this out a bit. You could always add a little more mashed banana next time if you want to use corn flour. Hi Kelly! I tried this recipe tonight and I followed the recipe, the only difference adding chocolate chips, but unfortunately it barely rose. I checked it at 45 minutes, but it was still quite raw inside so I left it for an additional 15 minutes. I let it sit in the pan for 30 minutes, and when I took it out and cut into it it looked like it was undercooked. I didn’t get the beautiful texture like yours did. I was wondering if you had an idea of what might have caused it? It still tastes delicious! Thank you. I’m sorry to hear that! What flour did you use? I love when bananas go over, it means I can make banana bread! 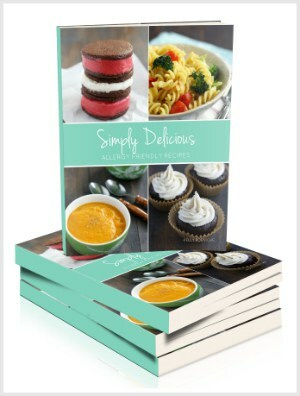 I was struggling to find a good gf vegan recipe until I found this one! It’s amazing! Tastes just like a ‘normal’ banana bread. Thanks so much, trying to stop myself from having a third piece! Yay! I am so happy to hear that! Thanks for letting me know! Hi Kelly! Great recipe and amazing result. I have tons of experience with baking but none with gluten free baking. I was nervous to try GF baking since there are so many flours, various blends, etc. I followed your recipe exactly with 3 exceptions: I used King Arthur GF all purpose flour (has no xantham gum), I used less sugar- approx. 1/4 cup sugar plus some honey (did not measure it), I added a “flax egg” (1 Tbsp flaxseeds + 3 Tbsp hot water). Baked it at 360 F for 20-30 min, then 350 10 more min. Nobody would guess this is eggless/dairy and GF banana bread. Thanks! There’s seriously nothing better than homemade banana bread! This recipe looks amazing and I’m digging all your flour adaptations! So helpful and brilliant! This is a great recipe!! Easy and delicious. I’ve made it several times and it is always a hit:) Thank you! So happy it’s a hit! Thanks for letting me know! I made this but I put in half of the sugar by mistake as I missed that there two lines with sugar in the ingredients list. It was perfectly sweet (even when my bananas were not super ripe) so I can’t imagine what it would be like if I had used all the sugar in the recipe. The second time I made it I knowingly omitted half of the sugar. I would definitely recommend reducing it! Otherwise it turned out great – I made it into muffins. They are chewy on the inside and crispy on the outside which I and my family liked. 7/8 of a cup of sugar, so just slightly less than a full cup. 1/8 of a cup = two tablespoons. So glad you liked this recipe, thank you for letting me know! Thank you for your Vegan Banana Bread Recipe: What would you recommend to lower the 51 g of carbs & 39 g of sugar per slice? Plus how would you lower 287mg of sodium per slice? Sugar & sodium are my dietary enemies! Too much sugar does not please my vegan friends either! You could reduce the sugar by one third if you wish, and you could also skip the salt. But there are going to be a fair amount of carbs, because this is a dessert. Hi! I followed the recipe but mine almost turns pasty when you eat it. It leaves a fine grainy feeling in your mouth. Any thoughts?! I’m sorry to hear that! What brand gluten free flour did you use? Made this tonight–our second time to have them. They are very good! My vegan daughter and vegetarian husband loved them. Those of us not vegan or gf loved them. They are a different texture from traditional– made mine as muffins with Cup-for-Cup gf flour. I used all coconut sugar. I think our family can cut out 1/4 c sugar for next time, but overall super good! Thanks! Made this last night and it was super gummy. Not sure what I did wrong?!? Curious about the sugar in this recipe. Is it necessary, or could I replace it with coconut sugar? I make this bread so many times before, but was searching for new conceptions. Why would you add vinegar pls? Just for a little lift – it reacts with the leavening agents! Could I sub applesauce for the oil? I know it might change the texture a bit but I’m ok with that. I just made this in muffin form and added some chocolate chips! I added another banana and they turned out great. My daughter and I are eating them as I type. Thank you so much for posting this recipe! These will definitely be a regular in our house. I made this with buckwheat, and while it was yummy it was quite stodgy so I think I will use almond flour next time! Thanks for the recipe! 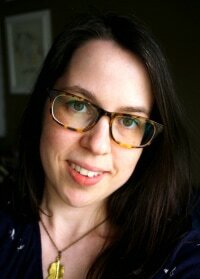 I’d love it if you checked out my blog coeliacwithoutborders.co.uk all the recipes are gluten free! Lovely bread, and the chocolate one! I like a good, uncomplicated, vegan, gf recipe with limited ingredients and pallava ? Can you please tell me what flour you use to make this delicious bread ? I’ve made it with King Arthur Flour and also with Namaste Flour as well. If you don’t need to be gluten free, spelt flour or all purpose flour works, too! I’m so excited to make this! If I don’t have gluten free flour blend, can I use coconut flour for the same amount listed? or almond flour? Coconut flour is really heavy and soaks up moisture. I think almond flour would be a better choice. I am allergic to vanilla. Can I make the recipe without it? It looks so good. Hi Theresa! I thought I was the only person on the planet allergic to vanilla! I’ve made this and just left it out, and it was great! Yes, any recipes that I have that call for vanilla could be made without it. Thank you for letting me know it worked for you! Hey there! This looks delicious and I can’t wait to try it! I would prefer to make them into banana muffins, so would the baking time change? And if so to what? Thanks! Yes, baking time will be much shorter! I would say about 15 minutes or so – check with a toothpick to make sure they are done! Banana bread is my ultimate breakfast weakness. LOVE the stuff and could eat it every day. This recipe looks great, Kelly! You definitely nailed the texture. — It looks so soft and moist inside! I’ve never heard about this flour, Kelly. I will try it for sure. I am always looking for healthy flour to try when baking. 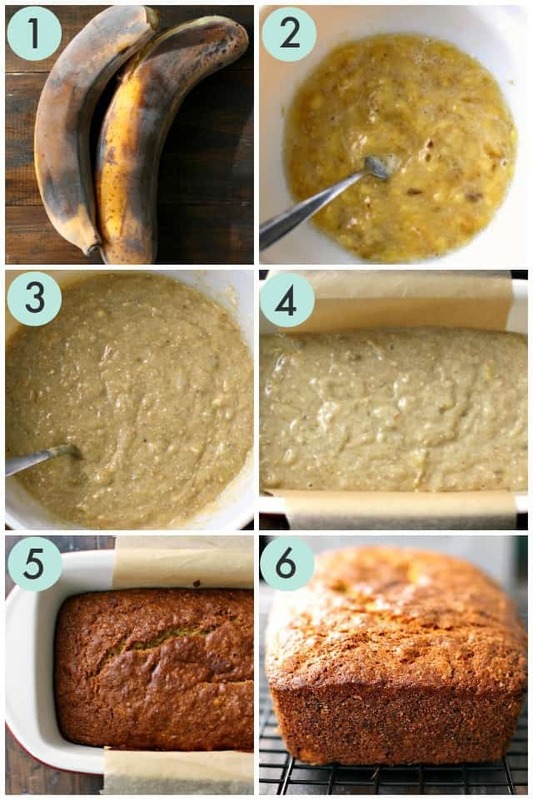 Your banana bread looks great. Thanks for sharing! I love banana bread! I’ve never actually tried a gluten-free flour mix before, which I have no idea why. I’ll have to look into the one you’ve used here. I also have the same problem -gumminess! This looks fluffly and light and totally delectable. Hehe and it’s funny that your boys wanted banana bread that badly -so cute!